Eryk Chazares’ Eagle Scout project both helps the RCMA of Plant City and honors one of his father’s biggest supporters. 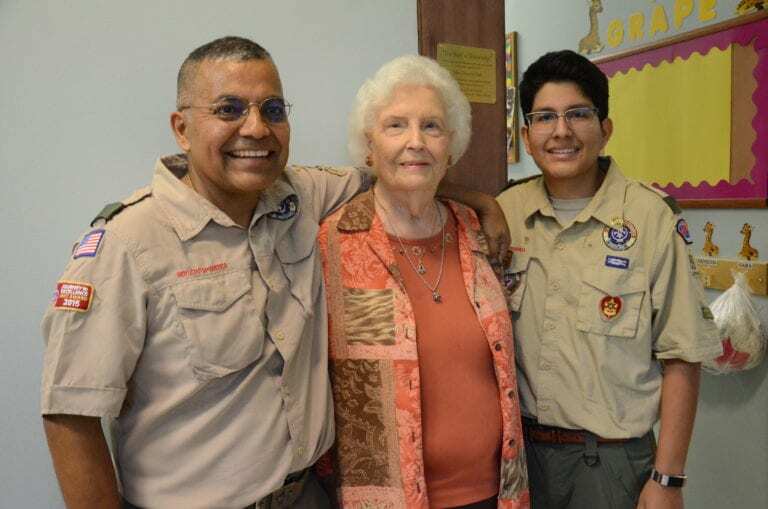 Though the newest bookshelf at the Redlands Christian Migrant Association Plant City Infant Center was Eryk Chazares’ Eagle Scout project, it’s not really about him at all. Eryk Chazares dedicated the “Shelf of Knowledge” on Monday to Dorothy Bell, a retired school guidance counselor who played a crucial role in the life of his father, Simmons Career Center principal Cleto “Sundy” Chazares. “I’m glad to have it presented and allow other kids to be more willing to read books and not quit in school, to be willing to keep learning,” Eryk Chazares said. Sundy Chazares’ life in a family of migrant workers meant he would be away from his home of Bowling Green for months at a time, going wherever his family went to work, and missing so much time he could have spent developing his young mind hurt him in the classroom until Bell, his guidance counselor in elementary school and junior high, stepped in to give him a place to live and a chance to open up his world. He pulled up his grades, blossomed into an exceptional cross country runner, was able to study art in college on an athletic scholarship and later earned a masters degree in educational leadership thanks in large part to Bell’s involvement in his life. Knowing his father’s backstory inspired Eryk Chazares to help the children of migrant workers open up their lives, too, through the bookcase. The idea for the bookcase was born last August and it was completed by December. It gained the “Shelf of Knowledge” nickname because even if kids can’t quite read all of the words on every page, he noted pictures can also tell compelling stories and inspire kids all the same. Whether they’re reading the words or looking at the pictures, the books may inspire kids to find their dreams in life and seek out the knowledge they need to go after them. To honor Bell, Erik Chazares installed a plaque on the left side of the bookcase. “My father would have never made it without your guidance, love and patience,” it reads. The RCMA Infant Center held the small ceremony Monday afternoon, which was also attended by Bell, Jason Jones of Troop 89 Valrico, Simmons guidance counselor Jeanne Redman Knotts and Hillsborough County Public Schools Area 5 Superintendent Sharon Morris, among others. Eryk Chazares has two years of high school left to go, but he knows he wants to be like his father and chase his dreams through higher education. He’s currently hoping to study engineering and said his father has inspired him to never give up on the dream.